Harty and Val Rita are two more clean, quaint, and cute francophone hamlets in the heart of French-speaking Highway 11. There’s not a tonne of stuff in Harty – St. Stanislas Church (founded in 1932), maybe 30 houses, and a playground. 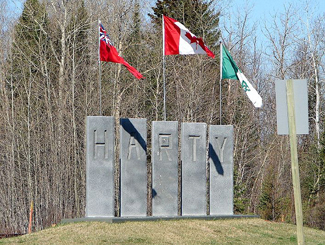 Harty’s town sign is nifty as you can see it from both directions on Highway 11 – there are letters on both sides of the pillars. The photo does not do this justice as it is hard to see the town letters carved into the concrete. As for Val Rita, well it’s a bit larger but unless you want to eat, get gas, wash your car, or go to church…yep those are your options. In terms of food, there’s a small Foodmart, as well as the Val Rita Chip Stand. The 24-hour The Auberge Inn (Auberge means ‘inn’ in French, no? So effectively the place is named The Inn Inn? That’s almost like “The La Trattoria” from the movie Mickey Blue Eyes) offers rooms, breakfast, and gas. There’s also a car wash and a caisse. Help me add more to this page, send an email to info (at) highway11 (dot) ca, or post below. I was raised in Val-Rita and moved away after high school to attend post secondary school in Toronto. I visit every year which brings back good old memories, with very little change in the village except some newer houses. Unfortunately, the grocery store Murray, the school and the only church are both closed. The school is used as a community/fitness center. There is a convenience store at the Inn located by garage Murray now called OK tire. 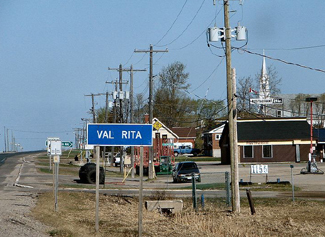 My mother was a school teacher who taught most of her career at the only elementary school in Val-Rita. It is nice to see the odd classmate who still lives in Val-Rita, Kapuskasing area, it brings back so many memories. Je me souviens, tendrement, de la belle Annette qui demeurait a Harty durant les annees 1950s. J’AI HABITÉ À VAL-RITA DE 1939-1945, MON PÈRE EMILE LEBEL ÉTAIT CHEF DE GARE.J’ ALLAIS À L’ÉCOLE VOISIN DE L’ÉGLISE.DANS MA CLASSE IL Y AVAIT DES PERRAS,DESBIENS,PRÉVOST,BEZNER,GLUCHINCO.DESLAURIERS,GALLANT.JE SERAIS HEUREUX D’AVOIR DES NOUVELLES DE CEUX QUI M’ONT CONNU. Est-ce que tu connaissait pierre rodolphe deslauriers quand tu etait un étudiant? Je pense que mon grandpere allait à l’école à val rita mais je ne sais tres peu à propos de lui. Il avait aussi beaucoup de freres et soeurs peut-être tu less connaissait aussi? Hi we are planning a vacation this summer (2012) which will take us through Val Rita to pay respects to family members buried in the cememtary. My first question is “Can we leave something like small solar lights on the graves?” My second question “Is there a camping area in Val Rita, if not where is the best place to camp over night in the area?” We travel with a tent trailer and dont need services and will be come from the west. Thanks in advance!! We bought a house here recently, it’s a very nice little town and not everyone speaks French, there are a few familys here who do not. But everyone I have met here has been very nice to myself and my family,and almost everyone who speaks French also speaks English and have been kind enough to do so! Two members of my family have got jobs in Kapuskasing (about 10km. )on first appling and neither speak a word of French, there are many jobs available. There are many beautiful homes here for sale at reasonable prices for anyone who would like a nice place to live. Business opportunitys abound! The summer here was great and the winters are good old-fashioned Canadian winters. Beleive it or not corn,raspberries,tomatoes,lettuce and many other vegetables can be grown here if started indoors, also many wonderful variety of flowers. So don’t be afraid of the Great White North it’s great here!! Hi. Thinking of buying property in Val Rita. Would like to know what your yearly temperatures are like? How long and cold is your winter? summer? What type of local agriculture is there? Thank-you. Hi there. I am looking for an old friend whom I still think about & who I think might now live in Val Rita. His name is Steve Trumble. He used to live in my hometown of Elliot Lake. If you could please help me get his email contact information I would greatly appreciate it. Thank you! I was born in Smooth Rock Falls. I have been gone from there since 1962 but keep going back every years. I know Harty as I know the whole north country. Harty is a place where the people are hard working and \\\”hearty\\\”. They live close by to a place named Reesor Siding. That place has its own story. I will let someone else tell about it. Cheers from Ottawa.